New Year Resolution: I Won’t Ditch Software on a Whim! In my previous role as UK Web Focus at UKOLN and my current position as Innovation Advocate at Cetis I’ve tried to be an early adopter of new technologies and services which seem to have the potential of enhancing the range of activities carried out in the higher/further education sector. An important aspect of such evaluation is the open sharing of thoughts on the potential benefits of the innovations but also associated risks and concerns. I will continue to evaluate new technologies. But there is a question as to what is being replaced if new technologies prove successful and become embedded in normal working practices. Over the years this has happened with technologies such as Skype. As discussed in a post published in 2009 which reflected on Skype, Two Years After Its Nightmare Weekend, at one stage institutions, and indeed, JANET, where looking to provide standards-based VOIP services. In, back in 2006 a UKERNA report (PDF format) described how “Uncontrolled use of Skype, and particularly its bandwidth-hungry super-node behaviour, is likely to breach one or both of these [Acceptable Use Policy]sections.” But how, I strongly suspect, use of Skype is now widely embedded across the sector (are there any institutions which still block the service?). There are other services which at one stage were considered to have risks by IT service staff but which have similarly become widely used by the user community: Google Docs is a good example of a tool which is often suggested when you are collaborating with people outside one’s host institution. Clearly changes to one’s IT infrastructure does happen and seems likely to continue. But what are the processes which one should take when choosing to replace an existing tool with an alternative? In a recent post Doug Belshaw, the Web Literacy Lead for the Mozilla Foundation, gave his thoughts on “Why I’m ditching Evernote for Simplenote (and Notational Velocity)”. Since I am interested in new tools which can enhance my productivity or provide a richer working environment I was very interested in this post. As a long-standing Evernote user which I use on a range of devices I have an interest in looking for signals which hint at problems with the application and an alternative solutions. However, on further investigation, I’m unconvinced that it would be sensible to move away from Evernote or make use of Simplenote. 10:14:37  0% Skipping uploading shortcuts because local shortcuts are not newer than the server shortcuts. Oh, so there’s a bug in the software. But it has been identified and therefore it should be able to be fixed. “They say to file another ticket. As for the audio file: even more bad news. It’s been nearly a month and the most substantive thing Evernote has said is that it is “seeing multiple users who have created audio notes of all sizes where they will not play on any platform.” The company has given me no information on what’s wrong with the corrupted file, and no indication that they might find a way to get it working in the future.“. But I’ve not had problems using Evernote – and as I don’t use audio notes I’m unlikely to encounter the bug mentioned above. But since Doug has suggested an alternative I felt it would be useful to investigate Simplenote further. I read information about Simplenote. But since my data will be held in the Cloud I am more concerned about the sustainability of the company rather than whether the software is open source or not. What do I find? The Wikipedia article for Simplenote is fairly basic. On further investigation it seems that a Mac app and an Android app were launched in September 2013. 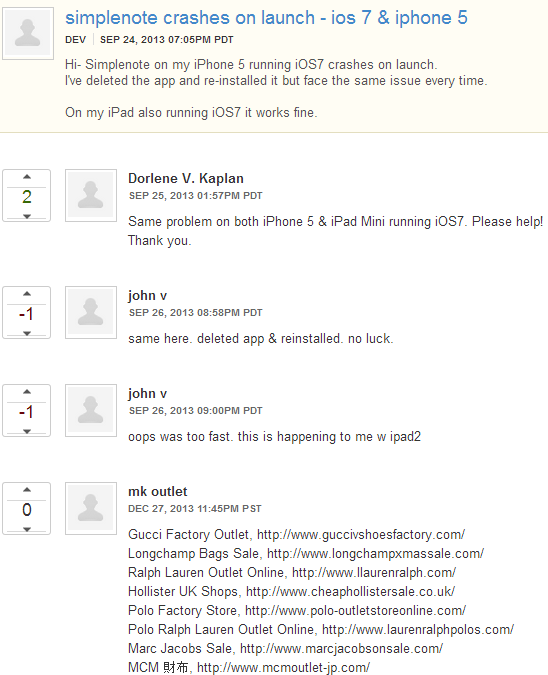 Since software is prone to bugs, it is not surprising that we can see examples of Simplenote users complaining of bugs. What is somewhat worrying is that, as illustrated, Simplenote’s official bug reporting service contains spam which has been there for over two weeks so far. And the bug report which was submitted in September 2013 has not been acknowledged. Out of the frying pan into the fire? Isn’t there a need to investigate the business model for important tools and not just sect a tool because it is open source? At least Evernote have acknowledged there is a problem and have said it will be addressed. Evernote also seem to have a sustainable business model. Sadly, I see no evidence that Simplenote do! It seems to me that ditching an existing tool which provides a useful service but which appears to have bugs for an unproven alternative simply because it is open source would be a mistake. OSS Watch therefore avoids making specific software recommendations. Instead the principal task is to help universities and colleges understand legal, social, technical and economic issues that arise when they engage with free and open source software. The goal is not the promotion of open source software for its own sake. Indeed, for OSS Watch the choice of proprietary or open source solutions is immaterial. What matters is that institutions have the resources to think through their procurement, deployment, or development IT concerns in a sensible and rational fashion. The best solution for any single institution will depend upon local conditions and individual needs. This pragmatic approach to advice and guidance is consistent with that employed by UKOLN in its work on standards. It is also a guiding principle in the JISC Policy on Open source software for JISC projects and services (JISC, 2005). This policy is based on the UK government policy in this area and should be seen as an implementation of that policy. The paper, which was published in 2007, focussed on institutional policies on use of open standards and open source software. Over 6 years later, in light of the importance of software which is not hosted within the institution but selected by individuals, there is a need to revisit the advice provided in the paper and explore how it can be applied when an individual is considering replacing use of an existing tool or service. I got the wrong sort of birthday present yesterday: a sincerely-written post by Jason Kincaid lamenting a perceived decline in the quality of Evernote software over the past few months. I could quibble with the specifics, but reading Jason’s article was a painful and frustrating experience because, in the big picture, he’s right. We’re going to fix this. The post has generated a large number of comments (96 to date) which seem to primarily be from other Evernote users who are frustrated by bugs i the software and are unhappy that the official Evernote response was written following the publication of Jason Kincaid, a blogger with a high profile. No blog posts since October. Unanswered questions in support center. When do.com announced it was closing up shop, I landed at Simplenote. I started using it for new notes right away, but I continued to look for an easy way to import my do.com notes to another cloud-based note app. Yesterday, I gave up and did a manual copy-and-paste on all of my notes to get them into Simplenote. Now I’m experiencing performance issues I wasn’t experiencing before. I’m hoping this is a temporary thing, but based on posts I’m reading here in the “support center,” it looks like this has been going on for a while now. Please don’t tell me that I am going to have to migrate all my notes to another tool. And no, there hasn’t been a response. Caveat emptor! Hi Brian, first of all my apologies that your comments on my blog didn’t get through. Others people’s did and I haven’t got to the bottom of it yet! Tool use is an individual thing and my blog posts about different ones I use (or don’t use) are meant to serve as thought pieces rather than exhortations. For me, the Kincaid post on Evernote was the straw that broke the camel’s back. I’ve experienced data loss and flaky behaviour. I also don’t need most of the functionality that keeps being added. Thanks for the reply. I tried 3 times to submit my comment on your blog but had no joy (even though it said it had been submitted for moderation). I think, though, that you undersell the influence which your digital presence has (almost 10,000 followers on Twitter!). And since you commented that “My blog post on Evernote made the front page of Hacker News: https://news.ycombinator.com/item?id=7010503“you are clearly aware that your ideas are picked up by others and may influence them. Indeed you have just written a post in which you seem to encourage people to Find what you can influence, and focus your attention. It’s good that Simplenote has been acquired recently. I hope that that does lead to enhancements to the service, including responses to the support desk, and a sustainable future. PS In the comment I tried to submit to your blog, I said I was pleased that you were back in the online world after your two month absence. I do enjoy reading your posts and your tweets. Thanks for the kind words, Brian – much appreciated! And apologies again for the comment thing. FWIW, I’ve been using Simplenote+Notational velocity for a couple of years, and generally have had no problems (finger trouble aside). Concerns about sustainability of the cloud service are ameliorated by the fact that NV maintains a simple plaintext (HTML) copy of all notes in the local file system, so if the service dies, I still have my data, and use of it on my laptop. What I might lose is the ability to see and update notes in my phone or on other machines. In this respect, it’s more dropbox than Google docs. Evernote I tried and quickly dropped because the extra functionality got in the way of the main requirement for taking and retrieving notes. For me, super-fast incremental search trumps the extra facilities. I’m not sure what this says to your wider point, so I’ll leave it at that.